Investors and traders were afraid of what the stock market would do over the weekend due to an air strike in Syria. Myself included. I too was worried about the reaction on Monday. But there was no impact. The air strike ended on Saturday evening and as Trump said: “Mission accomplished” (we have heard this about Iraq once); the markets actually rallied. The S&P 500 futures opened more than 15 points up on Sunday and the market ended Monday trading 21 points up. Is there anything else coming on us we should be worried? I hope not. And if we are good now, no more Trump’s political escapades, no more wars, no other issues, then it will only be earnings season determining the next move. The banking earnings started lukewarm on Friday last week but today a few companies, reported good earnings. I hope this will continue and prop the market. Zero Hedge uses the following chart as an evidence that we are in the beginning of the next crisis. Of course, they are wrong. How can anyone sane be comparing today’s economic development with 2007 economy is beyond my understanding. In 2007 the US economy was clearly deteriorating (while everyone was ignoring it) but today, our economy is still improving: inflation stable, unemployment down and decreasing, jobless claims decreasing, etc. 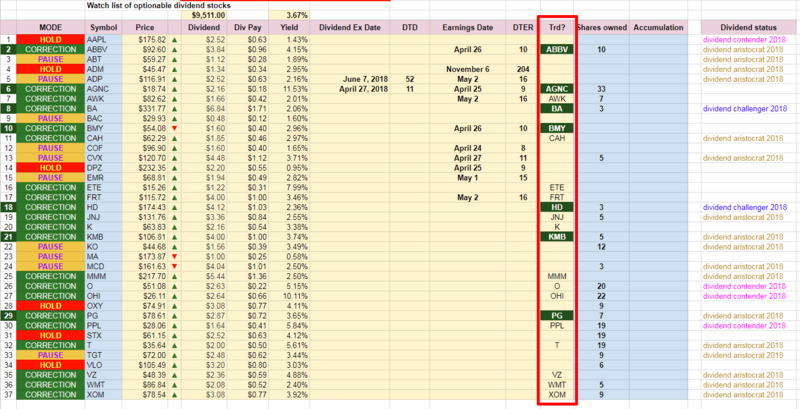 ; and hopefully this quarter’s earnings season will prove that companies are still doing well and making money. I still believe that this market will not turn into a bear market in the near future and that we have 1 to 2 years of a bull market. I still think that this 10% correction is just a necessary correction to reverse the overbought and overvalued market into its mean. 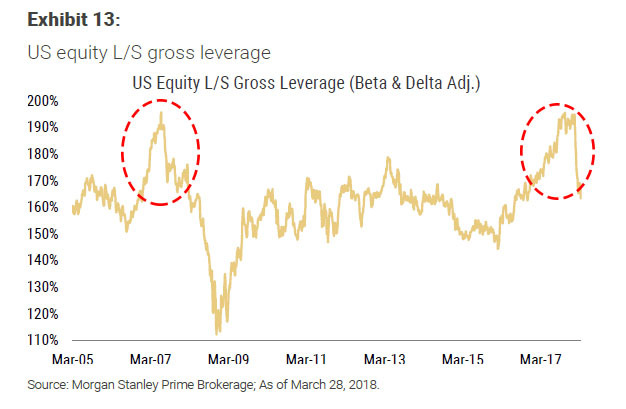 The chart above is actually proving the point, that this correction is not a pre-crisis spike in hedge fund leverage which is now crashing as the crisis develops but a reverse to means. In growing economy/market, these corrections function as such – corrections. The hedge funds return to mean too as during the corrections they are forced to reduce exposure and leverage which is in fact a healing factor of the market so it won’t overheat and then crashes. If however, we had a deteriorating economy, I would agree with Zero Hedge, that this would be a great indicator of a reversing market. But we are not there yet. The selloff we experienced in February 2018 was just a correction to reverse and now we will experience a recovery (as long as the economy keeps doing well) and I still expect the recovery to be 2 to 3 months ahead (end of April or May) with the market making new all time high again (probably end of the year). Although, I pictured the recovery to be smoother than it was playing out, I never mentioned that it won’t be a bumpy ride. Originally, I didn’t expect to have a re-test of February lows as my historical studies indicated that out of several occurrences the market re-tested the lows only once (in 1998). We had the re-test, and we closed below 200 DMA (both bullish setups), which is an event possibly postponing the 2 to 3 months recovery from the re-testand thus we may see the market actually correct in June or July than in April – May as mentioned above. However, this market recovery still shows signs of weakness and that “smart money” are not yet done with unloading their positions. One indication is that for a few weeks we experienced the market actually drop at the end of almost every trading session. It is said that smart money usually trade at the end of the trading day (about one last hour) and they unload into strength of the day when dumb money purchase stocks and prop the market up. If that is a correct observation then we are still seeing distribution. It is bearish for the market. How to trade this market? It still is same. If you are invested in stocks (as in my case, high quality dividend aristocrats), stay invested. Of course, this depends on your strategy. If you are invested for long haul, like 20 or more years, definitely, stay in stocks and do not be panic selling because everyone around you is freaking out. However, keep cash on hand, invest new money sparingly. Keep some money for the market indicating a clear direction. If there will be no recovery and we really turn into a bear market (not expected at all). Invest only small portions of money and regularly. For example, if you have $5,000 to invest, split it into smaller amounts (depends on your commissions and fees) and keep buying smaller amounts every month. As a trader, it pretty much doesn’t matter where the market goes. You can make money when the market goes up as well as down. But it can be tricky. It can be frustrating. And it can be dangerous. When the market is going up and down in large swings (1% or 2% in a day), trading the swings can be extremely dangerous. You can get completely whipsawed and destroy your account. If you are not very confident it is better to stay aside. Or, wait for a down day to open a bullish position only and wait. I wouldn’t engage much into timing the market to go bearish when the market goes up, in fact, I expect more up days now on and selling calls, for example, can harm your account. Today, I had no trades. I am fully invested (although not happy about it) so I stayed aside today and enjoyed the ride up which had a very positive effect on my opened trades.